Delgado received the award from Suffolk County Legislator Monica Martinez for her commitment to the community. Pilar Delgado (C), Director, Adelante, received The Hispanic Heritage Award, from Legislator Monica Martinez (L). 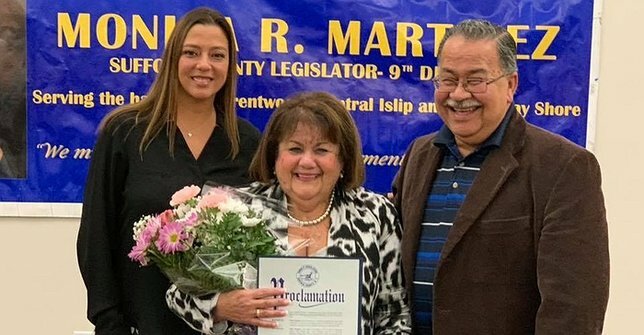 Central Islip, NY - November 9, 2018 - Adelante of Suffolk County, Inc. (Adelante) is proud to announce that their Director, Pilar Delgado, received the Hispanic Heritage Award from Suffolk County Legislator Monica Martinez, at the Legislator’s Hispanic Heritage Month celebration. The celebration was held at the Central Islip Public Library in October. Pilar was honored for her commitment and dedication to the progress and growth of the Hispanic community. “All of us in the FREE Family are thrilled for Pilar,” said Robert S. Budd, CEO, FREE. “Pilar Delgado is a tireless advocate for the Hispanic Community and a true partner in service,” he continued. Pilar Delgado was born in Brooklyn, NY to immigrant parents from Puerto Rico. She was one of six children and learned the value of sharing early on in life. Her parents taught her and her siblings to forge forward, persevere, and try to be the best one can be, as well as to “always give back”. Upon leaving Brooklyn, NY, she was married and set out to achieve the American Dream of owning her own home. She and her husband, settled in Selden, in Suffolk County. She yearned to stay connected with her roots and ended up becoming Director of La Union Hispanica where she found her true purpose in life – to serve the Hispanic community. Pilar went on to become a part of the board of Adelante of Suffolk County, where she served for over fifteen years before becoming Director. “I love connecting with the Hispanic population,” said Pilar Delgado, Director, Adelante. “To put it simply, I love my job and love what I can accomplish with a simple smile on my face. I do not stand alone; my husband and family encourage me every day,” she continued. Adelante is an affiliate of Family Residences and Essential Enterprises, Inc. (FREE), a not-for-profit agency that proudly supports more than 4,000 individuals with intellectual/developmental disabilities, mental illness and traumatic brain injury. About Adelante of Suffolk County, Inc.
Adelante of Suffolk County, Inc. is a not-for-profit multi-service community-based organization that provides services to the culturally diverse communities of Suffolk County in the areas of health, education, employment, supported housing, youth leadership development, volunteerism and culture. It was founded by a group of concerned Latino/Hispanic citizens, who advocated for the need to improve the quality of life of their community members, to promote Latino/Hispanic culture and civic responsibility as well as to foster the educational, economic, social and cultural awareness and pride of the community. For more information please call 631-234-0149 or visit www.adelantesc.org. Subject: LongIsland.com - Your Name sent you Article details of "Adelante of Suffolk County Director Receives Hispanic Heritage Award"